A revamped version of Nintendo's tablet-esque Wii U controller was leaked to the net recently by a QA tester from LEGO series developer Traveller's Tales. The tweet revealing an image of the new Wii U controller design has since been removed, but not before the image itself circulated the web, offering ample room to analyze the changes. The most obvious alteration is the controller's sticks, which actually are analog sticks now. The original controller design shown at last year's E3 featured analog circle pads like those found on Nintendo's 3DS handheld. The shift to analog sticks is presumably to facilitate clicking the sticks in as buttons, which would facilitate easy adaptation of Xbox 360 and PS3 controls to Nintendo's controller. However, click-able sticks were never a feature on any past Nintendo controller. The other big change comes from the start and select buttons, which have moved from under the controller's screen to a much easier to reach location under the controller's primary face buttons. Perhaps the most intriguing change are two white squares etched into the controller - one underneath the D-pad and another next to the power button. The squares look like they could be buttons of some sort, though they sit flush with the controller's face and in awkward locations to reach, making them ill-suited to regular use. One theory is that they toggle between a game that displays on the TV screen and the screen built into the controller. When Wii U was first introduced one of the proposed uses was for a child to continue playing a game on the Wii U screen while their parents change the channel on the TV. A button on the controller could be used to switch between those display options. Another theory is that the squares could mark the location of the Wii U's NFC chips, a feature that would allow the system to read data from cards and figurines similar to last year's breakout hit Skylander's Spyro's Adventure. The final major alteration is that the new controller design features Nintendo's official Wii U logo. A company putting the system's logo on its controller typically wouldn't be news, if not for the recent rumors that Nintendo was considering a name change. It's unclear exactly where the name change rumors started, though each rumor pointed to the Wii brand name being weak with core gamers, as well as potential confusion whether Wii U was a new console or simply a new controller to use with the existing Wii. Nintendo didn't seem to take much heed of the rumors though, with the Wii U name emblazoned on the latest controller design. 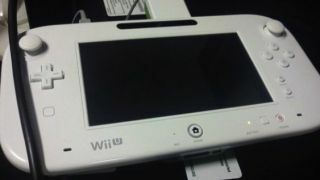 With E3 just around the corner, we're about to get a much closer look at the revised Wii U design. The system is expected to launch in time for the holidays this year, so expect a more thorough breakdown of the final hardware and its launch lineup of games from E3 in June.